This photo was unplanned, and I had no screen capture with me when I took it. We were intently searching for a scene we DID have a screen shot for, but couldn't find. 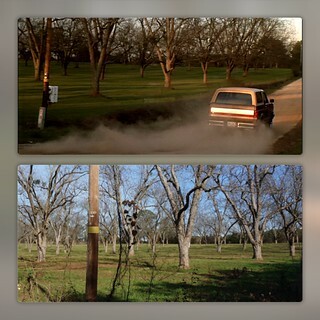 As we drove all over the area, I spotted this area of trees and since I have seen the movie countless times, I knew it looked familiar, from the scene where District Attorney Trotter and Vinny go hunting together. After returning home and watching the movie, I was happy to have found another location. Good thing too, since we never did find the one we were actually looking for!